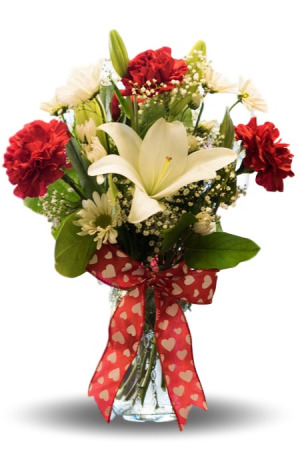 "Cherish" your loved one this Valentines Day with this red and white arrangement in a mason jar. 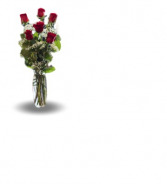 Let her know that you were "Love Struck" when you saw her for the first time with this have dozen rose vase. Price shown is for 6 roses. Medium is 9 roses and Large is 12 rose. Vase may vary. Container is 8" tall. 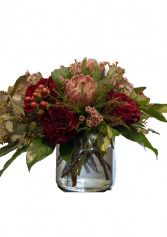 "Tropical Love" is designed with pink protea and heart roses. Vase is 5" tall. Sending Hugs and Kisses will warm someones heart this Valentines Day or any day of the year. 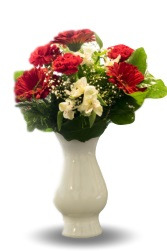 Vase is 7" tall Upgraded prices include more flowers and are designed to keep the same look and feel of the arrangement.